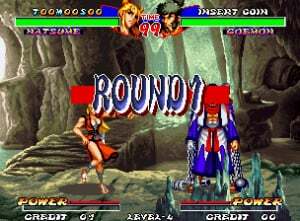 Not only were there a huge number of fighting games throughout the lifespan of the Neo Geo system, there was also a serious amount of variety in the styles and executions of those games. While most Neo Geo fans will associate developer ADK with its popular World Heroes series, it was its final release for the system, Ninja Master's: Haō Ninpō Chō, that might be its most unique and interesting game. Of course, the big question is: does it offer up enough new elements to make it worth a download for Wii owners whose consoles are already brimming with Neo Geo fighters? Upon first glance, Ninja Master's looks fairly standard and pretty much like most other fighting games available on the system. You're able to take on the game in either a single- or two-player variety and you have a wide range of characters to choose from. Each character has their own distinct fighting style and a host of regular and special moves to make use of. But what makes the game so unique is that you can switch between weapons-based combat and hand-to-hand battling, all with the mere push of two buttons. When your character isn't holding their weapon, you can use light and strong punches and kicks against opponents. Pulling your weapon out then gives you various types of slashes that can be very effective if used correctly. It's this strategic toggling between the two fighting styles that can win or lose a match, especially when taking on some of the game's stronger characters. Combos play a key role as well; you soon find that stringing together multi-hit combos can be very effective against overly aggressive players. There's a nice responsive feel to Ninja Master's which is reminiscent of the earlier King of Fighter titles. 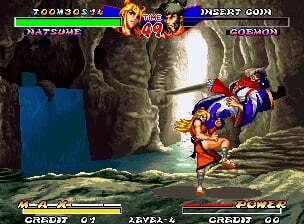 Even using weapons still feels far more fluid than the combat from the Samurai Shodown titles. It would have been nice to see the developer take the weapon fighting a bit more in-depth, but you can't help but appreciate the polished play controls and smooth execution the game offers up, especially when you pull off one of those 20 hit combos. Fans of the heavy oriental themes of games like Samurai Shodown and The Last Blade will definitely appreciate the backdrops and characters in Ninja Master's. While not quite as graphically detailed as those in the aforementioned titles, there's a certain beauty to the simple designs used. The amazing monochromatic flash that signals the end of a fight is also a nice touch and adds a nice climactic feel to winning a round. Even the individual fighters feature a nice degree of detail and animation. Much like the visual style, the musical score is laced with tons of Japanese-themed music tracks, some among the best heard on the system. Sure, there are a few average tunes here and there, but overall it's a strong effort and one that does a fantastic job of conveying the scenery you see throughout the game. Care was put into getting the individual characters and the fighting announcer voices right, and it pays big dividends for the quality of the overall audio package. 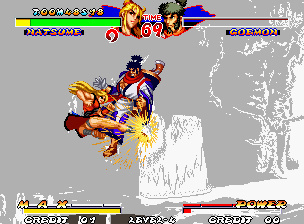 Ninja Master's is certainly one of the more unique fighting games to appear on the Neo Geo system; at times it feels like a combination of Samurai Shodown and King of Fighters rolled into one game. The change-up between weapons and hand-to-hand fighting adds a bit of diversity, but you can't help but feel that it could have been taken a little further. 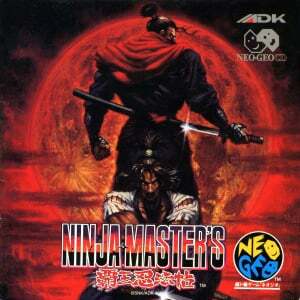 For Neo Geo fighting game fans who've experienced much of what the system has to offer, Ninja Master's at least offers up a fighting experience with a fresh twist. but one that's very much worth looking into. Still, you have to wonder: what is it the Ninja master has? 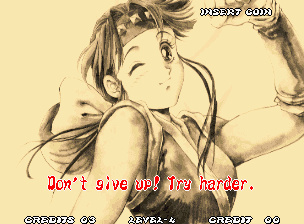 I know these are well made, but come on, you made other fun games too SNK. Magical drop III (Which is on the VC), Crystallis and many others like blazing star... WHERE ARE THEY? @CrimsonMoonMist Haha, my thought exactly! Those ninjas and their indefinite possessions. Thanks for the review Corbie, this looks like a fun little Neo Geo fighter I hadn't heard of at all! I'm loving Last Blade at the moment so this might be a great follow up! I kinda stumbled upon this one years ago when I was buying games for my arcade cabinet. I bought it with a group of games I wanted and just happened to really like it. Nice change of pace title. I heard of this game. Did not know it was on vc. Gotta love the misuse of the apostrophe in the title! @PinkSpider I don't know,but NeoGeo should keep them coming,Fighting games are my favorite genre and it's always nice to try out new titles(because let's be honest all we had at first were a gazillion Street Fighter 2 games and the so-so ClayFighter games. I'll definitely check this one out,i am on a mission to try out every NeoGeo fighter,especially since i have found some really good ones(namely The Last Blade games ). For God's sake please release Sengoku 3 !!!! "The apostrophe in Ninja Master's refers to the kanji in the title which (roughly) translates translates to: "The Book of Ninja Skills Belonging to the Emperor""